If you want to discover more museums and cute cafes in Paris that are off the beaten path, check out our Paris Museums Guide! Come on, you’re in Paris! Forget about Starbucks! 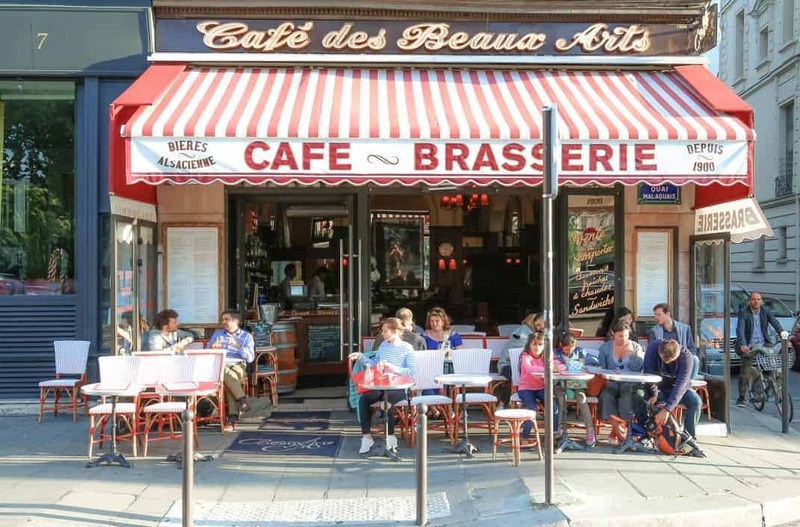 To find the best coffee in Paris you should avoid those coffee shops constantly packed with tourists such as Café de Flore, Cafe Les Deux Magots or Cafe Des Deux Moulins. We have some very original Parisian cafés to recommend that are full of character, making sure you won’t only enjoy a cup of quality coffee, but you can also relax in the best coffee shops in Paris like a local, while taking lots of Instagrammable photos! INSIDR wants to help you find the best cafe in Paris that suits your preference. Start your day with a cup of coffee at Le Pure Café! This is where the lovely couple Jesse and Céline met again after 9 years in the film Before Sunset. The coffee shop has a stunning yet intimate interior that is super photogenic, romantic and typically French, perfect for spending a loving moment with your movie lover partner. Relive the movie scene at this beautiful coffee place! Being the first cyclist café for coffee in Paris France, this minimalistic coffee house is actually a concept store that reunites cycling, fashion and coffee! Get their 10€ menu that comes with a French quiche or soup, a homemade dessert and an expresso to boost your morning energy, it’s a very good deal. If you are a biker, how can you miss coming here to chat with others who share the same passion? This neo-roaster in Paris does very fine coffee with a convivial vibe! Big tables in the shop gives you the community feeling where customers are free to exchange and chat with one another. Although laptops or tablets are no longer allowed in the coffee house, you can still enjoy a good conversation with those around you whilst enjoying some of the best coffee in Paris. They offer amazing brunch on Sundays so usually on weekend it will get busy, better go there early! Have your cup of coffee or breakfast at Passager! Their rustic wooden interior is very cosy and photogenic (absolutely Instagram worthy! ), with friendly staff and a laid-back vibe for you to chill out with your friends or alone. Take it slow, have a sip and enjoy the calm moments like how French people live! First thing’s first: coffee! Nowhere else can delve into coffee as deeply and professionally as in La Caféothèque! This is a space of roasting quality coffee! There’s a “Salon de Cafés” where one falls in love with the “café culture” that is carefully exhibited according to the origins and types of the coffee beans! Just imagine that it’s a library for coffee, you get the idea right? This is the coffee communal with a concept that is incredibly ideal for coffee lovers who need to find space for co-working! You’ll just have to pay 4€ per hour, and there’s a barista ready to make you quality coffee from espresso, cappucino, café crème etc for you. Toasts, biscuits, fruits and drinks are free and unlimited, all you need to do is just serve yourself a plate of munchies and a cup of coffee, then find a seat to start working! It’s perfect for students, writers, business travellers or even those who look for a quite yet energetic place to read a book! This cute coffee-bakery has becoming a local hit! They do super lovely panda patterns on their coffee that would instantly capture your heart! From Indian expresso, Ethiopian coffee to the « French Press », you can find a cup that suits your taste.The cheesecake there is absolutely delicious too, if you fancy some desserts. There’s also a hearty library for you to pick a book and spend your afternoon reading! Looking for a cool place to chill? In La Chambre aux Oiseaux, you’ll experience some tenderness with their soft background music, quaint English wallpaper and old wooden/ leather furniture that give you this vintage Art Déco atmosphere. Their chocolate pear cake and homemade fruit jams are must try too! The Franco-British dream team behind Le Bal and Ten Belles; Alice Quillet, Anselme Blayney and Anna Trattles, have very recently opened Ten Belles Bread, their third café in the trendy 11th arrondissement. The latest installment in their epic café trilogy is an wonderful mix between a boulangerie, food lab and coffee bar. Located in a corporate cove of an otherwise off-the-wall, fun 11th district, Ten Belles Bread is a vast space, opening out onto a terrace, with a stripped back, modern feel and where the focus is on bread and coffee. Founded by Christophe Servell, Terres de Café has grown to consist of four coffee boutiques as well as an online store selling a vast range of their purest, highest quality expresso capsules, coffee machines and coffee. Walk through the tastefully understated entrance, you are instantly greeted by the welcoming aroma of rich, freshly brewed coffee. Terres de Café is not a café in the traditional sense, rather it is a “coffee bar”, and by its very definition should be enjoyed as one would enjoy a session of wine tasting at a quality wine bar. This coffee joint is a place to taste, discuss, buy, and savour quality coffee by expertly trained barista’s. Lockwood is the perfect place for a drink with friends or for a cosy romantic break after a long walk in the Opera area of Paris. During the day, families will also enjoy the nice selection of coffee and cakes! It’s such a great hidden spot for coffee during the day, and for drinks in the evening. You’ll spot many young startup workers in the early evening, as the area is often called the Silicon Valley of Paris (a mini version!) Don’t miss the aperitivo before dinner time to nibble on revisited tapas while sipping on a nice cocktail before heading to a nearby restaurant after. The contemporary and wooden atmosphere of the corridor-like café/bar makes a great cozy spot. The very friendly and approachable staff will guide you through their wide range of drinks, coffee, cakes and tapas!